For basic looping with an electric instrument, there’s no better choice than the RC-1, the newest member of the Loop Station family. Its compact size and simple operation make it perfect for use with guitar and bass, though it also works great with other instruments like synths and electronic percussion. 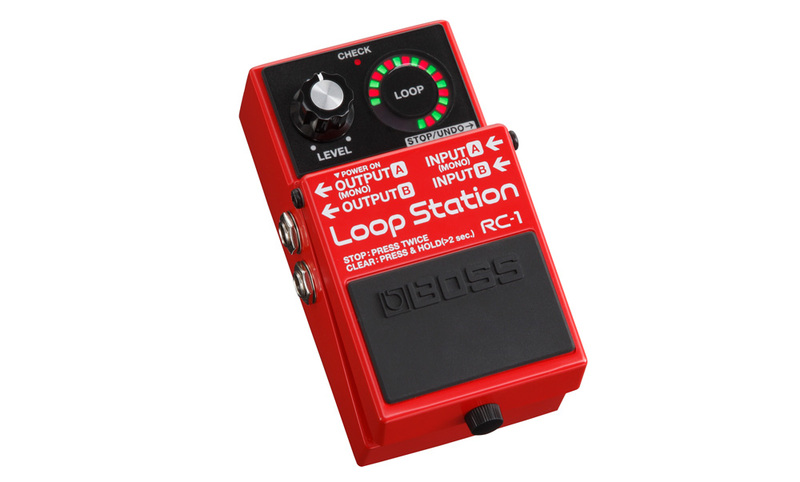 BOSS RC-1 Loop Station: simple and fun. Incredibly intuitive to use, the RC-1’s single integrated pedal switch controls all looping functions: record, overdub, play, stop, and undo/redo. Loop level is adjusted with a single panel knob, while the cool circular indicator provides 24 LEDs that show the current operation mode and the cycle of the active loop. 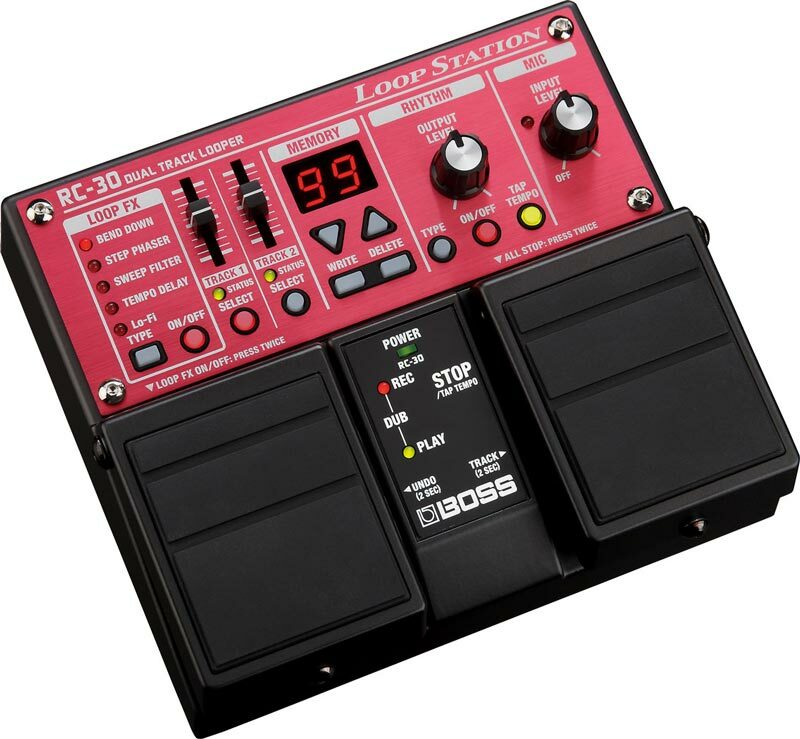 BOSS RC-1 Loop Station with optional FS-7 Dual Footswitch. 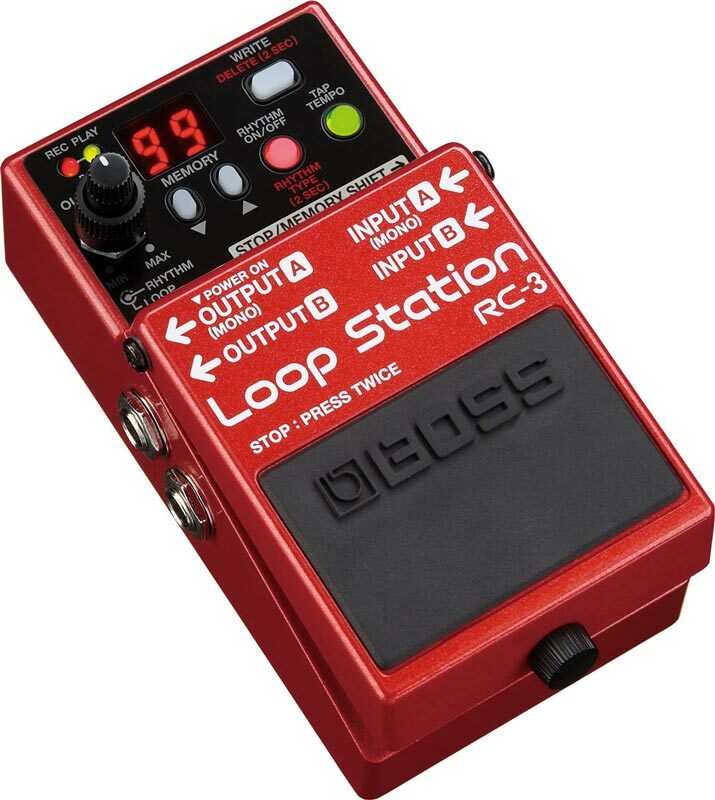 If you want to take your looping options a little further, check out the RC-3. It’s the same size as the RC-1, and loop functions are controlled in a similar fashion with the single integrated pedal switch. 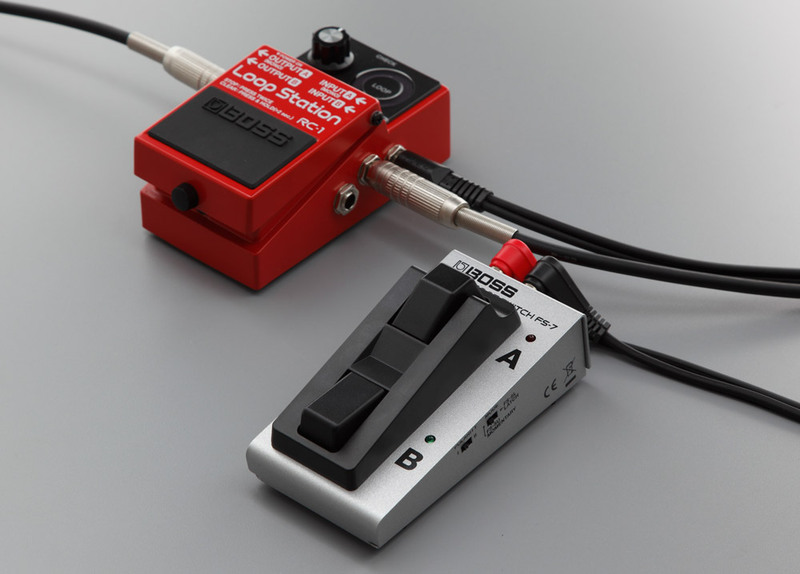 It also offers true stereo I/O and support for expanded control via external footswitches. The RC-3 is great for basic looping, and it also includes built-in rhythms to keep your loops tight (though you can loop without the rhythms if you like). But the biggest thing that the RC-3 adds over the RC-1 is more looping time and onboard loop storage. It provides a full three hours of time for recording loops, and has 99 memory locations for saving loops for later recall. The RC-3 is also equipped with USB, allowing you to connect to a computer for backup and file swapping. The RC-3 Loop Station offers three hours of recording time and 99 memory locations for storing loops. Onboard loop storage makes the RC-3 a really versatile tool for performing and practice. For example, you can store different song sections (verse, chorus, etc.) in memory locations, and play them back sequentially using external footswitches for dynamic backing. With so much time available, you can even load up complete songs in the memory locations, using the RC-3 as a convenient playback device for live backing tracks and jamming. The RC-30 starts with the basic RC-3 feature set (three hours of recording time, 99 phrase memories, rhythms, etc.) and adds more, more, more. This powerful looper is housed in the BOSS Twin Pedal format, which provides two integrated pedal switches along with expanded real estate for a lot of great extra features. The RC-30 Loop Station supports two synchronized loops and features onboard effects. The big standout feature of the RC-30 is that it’s a dual-track looper, which means that you can record two different synchronized loops and play them back at the same time. This opens up new avenues for creative performances, allowing you to create more complex loop pieces in real time. In addition, the RC-30 is equipped with built-in Loop FX such as Sweep Filter, Bend Down, Lo-Fi, and others. You can apply these effects to phrases as they play back, providing an additional way to make your loop performances interesting, fun, and unique. The RC-30 also offers the most input options of all the compact Loop Stations. Like the RC-3, it has mono/stereo instrument inputs on 1/4-inch jacks, plus a stereo Aux In. But the RC-30 also has an XLR mic jack, making it the compact looper of choice for traditional singers, vocal beatboxers, and acoustic instrumentalists. The XLR jack features switchable phantom power for using studio-quality condenser microphones. All the inputs can used at the same time, so you can easily capture loops from a variety of different sources at once. The rear panel of the RC-30 Loop Station provides inputs for a variety of devices, including a vocal mic. If your looping aspirations take you beyond the compact Loop Stations, you’ll want to check out the RC-300 and RC-505. Packed with advanced features for power users, the RC-300 offers three simultaneous loops in a floor-based pedalboard configuration that’s ideal for instrumentalists and players who sing. Equally loaded with top BOSS tech, the RC-505 provides five independent loops in a tabletop unit that’s perfect for singers, beatboxers, and DJs. 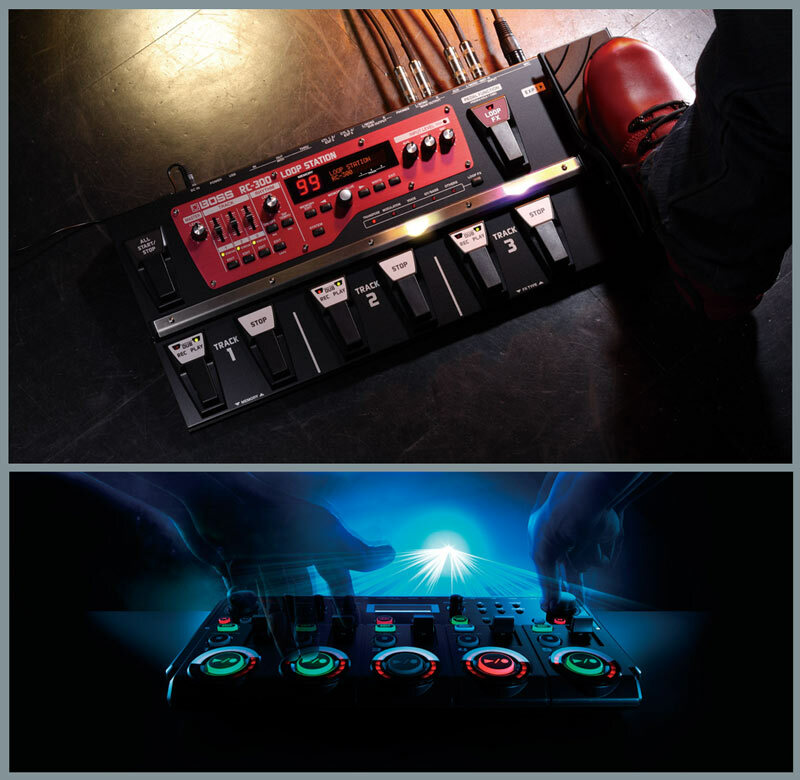 The RC-300 (top) and RC-505 (bottom) offer advanced features for more sophisticated looping performances. Learn more about the entire Loop Station lineup at BossUS.com.